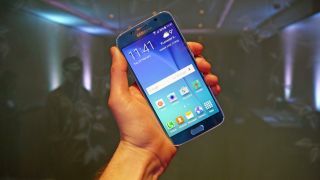 Samsung's launched the phones we knew it would at MWC in Barcelona, with the Galaxy S6 and S6 Edge landing precisely as predicted. The big news is the design: the 'standard' Galaxy S6 is clad in a metal unibody that offers a higher-end finish than the recent A Series, due to it adding glass to the front and back. The Galaxy S6 Edge is slightly different in that it has a 'dual curve' screen that bends down at the edges of the phone, giving new options for the display with tactile elements for hitting up your favourite contacts and control music without disturbing your main app. Both phones will come in a variety of 'translucent' colours to offer consumers a different flavour, which Samsung is hoping will hide the fact its got rid of the microSD slot and removable battery from last year. The former is designed to speed up the internal workings of the phone, with everything coming from the 32GB / 64GB / 128GB capacity, and the latter is to allow for a more sleek unibody design. The camera remains at 16MP on the rear, with 5MP on the front, and both have upgraded low light abilities (f1.9 aperture, if you're curious) as well as Auto HDR. Samsung hasn't revealed the Galaxy S6 release date or price (for either model, actually) but we're pretty sure it's going to be around April that you can get your hands on one. Expect to pay something close to the iPhone 6 levels for the phone, if not a little more for the S6 Edge.